To celebrate National Yorkshire Pudding Day on 3rd February, Wren Kitchens has sourced the barmiest ways to eat a Yorkshire pudding. Sweet or savoury, it’s your pick! The classic Yorkshire pudding served with a Sunday roast is still the nation’s favourite, however Wren Kitchens has always been a fan of a little British ingenuity – which is why it’s found the best of the nation’s weird and wonderful takes on the Yorkshire pudding popping out of ovens across the UK. From Yorkshire pudding ice cream cones to Yorkshire pudding pizza, you decide if these alternatives are mealtime heaven or supper sacrilege. We all now have an excuse to eat Yorkshire puddings for breakfast! The Porky Pig a café in Manchester is selling a full English inside a Yorkshire pudding – hash browns and all. Or, if you can’t make it to the North West but still want a piece of the pudding, you can recreate a fancier version (as seen below) and impress your loved ones with this recipe on Sorted Food. For another excuse to eat Yorkshire puddings for breakfast (with bacon and eggs! ), see this tasty recipe on Serious Eats. To level up your pud, it suggests adding crumbled breakfast sausage, mushrooms, and onions sautéed in butter instead of bacon. Yorkshire puddings aren’t just for your main course, they make a delicious dessert too. Some have been known to add pancake toppings, like lemon and sugar, to a plain Yorkshire pudding and simply get stuck in like it’s Shrove Tuesday. Others might go the extra mile and create Yorkshire pudding chocolate profiteroles. You can’t beat an original. Toad in the hole is a traditional English and Scottish dish consisting of sausages in Yorkshire pudding batter, usually served with gravy and vegetables. But we didn’t need to tell you that. Toad in the hole is the second most popular way to eat Yorkshire pudding batter and has racked up over 38k Instagram hashtags (#toadinthehole). This traditional recipe goes down great any day of the year. It’s not just the Tour De Yorkshire cycle race that mixes a little Français with the white rose county. 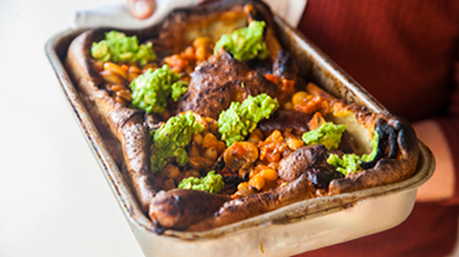 This is a great mash-up dish where France meets Yorkshire and is a super quick idea that will surprise your guests at a dinner party or get together. Simply use your favourite quiche recipe to fill a Yorkshire pudding crust, like in this recipe from Oh My Veggies. The Yorkshire pudding wrap has pushed Yorkshire puddings into the street food spotlight. A BBC video about Yorkshire pudding wraps received more than 13 million views online and more than 4,725 posts on Instagram (#yorkshirepuddingwrap). A Yorkshire pudding wrap is basically a Sunday roast wrapped in a Yorkshire pudding. But there are other variations hitting the streets: Yorkshire pudding wrap burger, for example. Interested? We’ve sought out the best places in the UK to go try a Yorkshire pudding wrap. This Yorkshire pudding twist takes comfort food to a whole new level. If you love mac and cheese and want to try something new, then this blend of creamy, cheesy pasta and crisp pudding is for you. 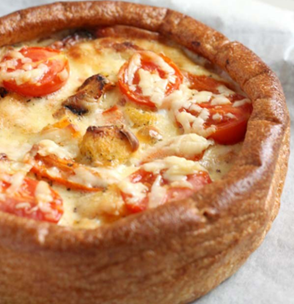 Sometimes opposites attract, like with the delicious Yorkshire pudding pizza. Supermarket chain Morrisons whipped up a storm last Yorkshire Pudding Day when it launched a version to buy in store, but if you fancy getting in the kitchen and making your own then, create an Instagram-worthy version by following this recipe. The Yorkshire Pudding Pie Co. is a popular street food van trading in and around Yorkshire. They’re basically pies with a Yorkshire pudding crust instead of pastry. Surely this is the ultimate Northern snack? An award-winning New Zealand chef has made one of Yorkshire’s most famous products even cooler, creating a Yorkshire pudding ice cream cone. You’ll have to travel halfway around the world to try these amazing creations, though, as they can only be found at Giapo in Auckland, New Zealand. For Yorkshire pudding inspired desert though, Daft Puddin’ has you covered with a range spanning from ‘Brew and Biccies’ to ‘Frozen Yorkshire Rhubarb Mousse’.